Sometimes the title of a disc misrepresents what it is about. That is the case with the present disc. 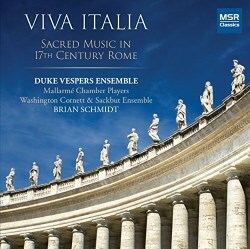 Its title suggests that we hear music written or performed in Rome in the 17th century. However, four of the pieces in the programme are from the 16th century (Palestrina, Victoria) and four were not written for performances in Rome, let alone the Collegio Romano. The latter institution was the inspiration for this recording. The Collegio Germanico—or, to use its official Latin name, Collegium Germanicum et Hungaricum—was founded in 1552 by Pope Julius III. One of the key figures in its establishment was Ignatius Loyola, the Spanish priest and theologian who founded the Society of Jesus. The Jesuit order has played a major role in the history of the Roman Catholic Church, and was one of the driving forces behind the Counter Reformation. That was also one of the motifs for the foundation of the Collegio Germano. Its aim was the training of German-speaking Catholic priests. After all, Germany was the centre of the Reformation, very much considered a battleground to win back the hearts and minds of those who had derived from the Mother Church. Music played a substantial role in the Collegio Germanico. Tomás Luis de Victoria was a student here and later acted as its maestro di cappella for a few years in the mid-1570s. His successor was Annibale Stabile, and later in the 17th century Giacomo Carissimi and Ottavio Pitoni held this position. There is historical evidence that instruments were involved in performances of sacred music from early on. This was the reason that two of Victoria's motets are performed here with instrumental participation. The liner notes say about his motet Ave Regina caelorum: "The instrumental arrangement created here aims to enhance the text, much as we predict Victoria himself would have done". However, there is no such thing as an "arrangement" here: the instruments play colla voce, as was common practice at the time. Nothing has been added to what Victoria has written down. The same goes for Regina caeli which concludes the programme. The disc opens with two items from Vespers: the sequence Deus in adiutorium - Domine, ad adiuvandum me festina, sung here in plainchant, and Psalm 110 (111), Dixit Dominus, in a setting by Marc-Antoine Charpentier. It is generally assumed that he was a student of Carissimi, but there seems to be no firm evidence of that. However, he was in Rome at the end of the 1660s, and he certainly must have known Carissimi. His music shows the latter's influence. He was not a student at the Collegio Romano, as he was not a man of the church. The Dixit Dominus performed here was written much later. The track-list does not give the number in the catalogue of Charpentier's oeuvre. It could be H 197 which, according to the work list in New Grove, dates from the late 1680s (the liner notes say "around 1688") and is for four voices. However, there were to be four solo parts, whereas the liner notes mention only three. The major work on this disc—recorded here for the first time—is the Missa Sancta Maria Magdalenae by Giovanni Felice Sances. He was born in Rome, and was a boy soprano at the Collegio Romano from 1609 to 1614. During that time he sang in opera performances. Later he seems to have been in Venice. In 1636 his presence at the imperial court in Vienna is documented, where he sang as a tenor. In 1649 he was appointed assistant Kapellmeister, and in 1669 he succeeded Antonio Bertali as Kapellmeister. It seems likely that most of his compositions were written during his time in Vienna. That certainly is the case with this mass: it was probably written for the Feast of Mary Magdalene on 22 July 1665, which was also the nameday of Leopold I's wife Eleonore Magdalena Theresia. It is scored for seven voices, six strings, two cornetts and four sackbuts. Sances was also a celebrated composer of sacred concertos for solo voices in monodic style. The two pieces here are quite different. Ave maris stella is also part of Vespers. This setting is for two solo voices, strings and basso continuo; the strings play ritornellos, and only join the singers in two of the verses. Texts from the Song of Songs have greatly inspired composers of the 17th century to some of their most expressive pieces. Sances's setting of Vulnerasti cor meum, for two solo voices and basso continuo, is no exception. Especially such pieces show that there was no watershed between sacred and secular music. Carissimi is also represented with a piece for solo voices and basso continuo, O dulcissimum Mariae nomen: "O sweetest name of Mary, name that is truly holy". It marks the importance of the veneration of Mary at the Collegio Germanico and at the Counter-Reformation as a whole. Five of the lines open with the exclamation "O". This was a word which created a considerable amount of excitement, certainly in the monodic style with its emphasis on expression. Among the singer's tools was the messa di voce, preferentially used for such passages. The excitement comes pretty well off in the performance by Laura Dawalt and Julianna Emanski, but the messa di voce is hardly used. That is a feature of the performances: overall it is fairly good, but not first class. The main reason seems that the performers are not specialists in this repertoire or in early music in general. The exception is the Washington Cornett and Sackbut Ensemble which plays period instruments. The strings are modern instruments, albeit played in period style. That is done pretty well, but the shortcomings are also clearly discernible. They lack the overtones of their baroque counterparts, and cannot produce the latter's penetrating sound. As a result, they are often not clearly audible in the tutti episodes. The singers do mostly pretty well, but several of them use too much vibrato. The alto Douglas Dodson has a lovely voice; he and Bille Bruley are responsible for one of the nicest parts of this disc, Sances's Vulnerasti cor meum. The motets by Victoria and Palestrina are well sung. Here we hear the best of the ensemble as a whole, whereas in the tutti of Sances's mass and in Charpentier the ensemble is damaged by vibrato in several of the voices. On balance, this release is most interesting because of the inclusion of a splendid mass by Sances, a reason to investigate this disc. However, from a stylistic point of view it leaves something to be desired.